Sleeper sofas offer a completely inconspicuous comfortable place to sleep. 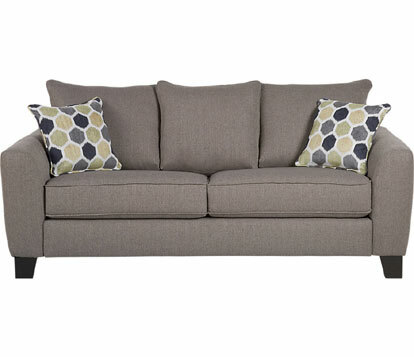 Comfortable and stylish sofa by day, they can be transformed into a full, queen or even a king bed by night. The best in class are built with easy to use mechanisms that make it quick and effortless to pull out a folding convertible mattress tucked away below seat cushions. For many, sleeper sofas invoke mental images of old rickety models with flimsy soft mattresses that barely cover uncomfortable frames. Construction and technology have come a long way and today’s models offer excellent comfort offering a restful, sound night’s sleep. Now more than ever, sleepers are a great choice for families, small apartments and in dual purpose guest spaces. 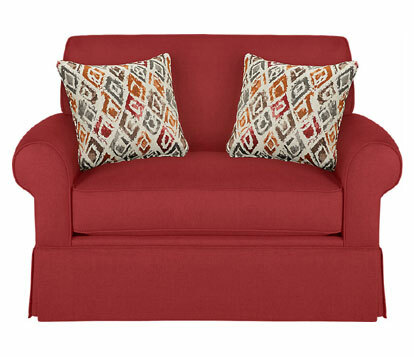 Whether as a nightly bed in a studio apartment, or an occasional place to welcome overnight guests to stay, your sleeper sofa can truly do it all. Sleepers are available in a variety of sizes, colors and fabric finishes, including fabric, microfiber and leather. Look at the sofas construction; check all of the things you would check when shopping for a quality sofa – solid frame and construction, quality cushions and comfort, quality upholstery or leather and stitching, etc. Sit on the sofa bed when folded with mattress inside. Many sofas are available with and without sleeper options, if you are buying the sleeper version of the sofa be sure to try a model with the sleeper inside. It is likely to feel a little different (typically a slightly firmer feel) than the non-sleeper option. You will probably use it more often as a sofa than a bed, so be sure it is comfortable to sit on. Pull out the sleeper in the showroom and try the mattress for comfort, inspect the mechanism and sleeper frame to ensure that it is solidly built to will handle use. Be sure the pull out mechanism operates smoothly and does not stick or squeak. Look for a thick steel bed frame that can solidly support weight and movement that is strongly attached to the sofa frame. Check for smooth edges all around to prevent tears and snags on your mattress or bed linens. Choose your mattress style. 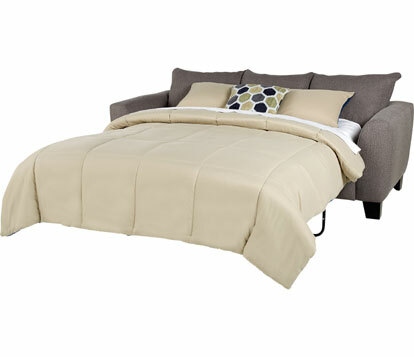 Look for manufactures who offer you a choice of sleeper mattress types. Some allow you to select between options like inner spring mattress or gel memory foam, giving you the opportunity to pick your preferred style of mattress. Check sizing carefully to be sure that you have space for the sofa as it stands when closed, and also that the sleeper will fit in your room when fully extended taking into account the other furniture in your room. Remember that you’ll want to minimize the how much furniture you need to move when you pull out your sleeper. 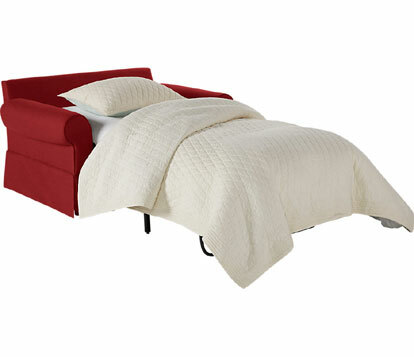 Sofas aren’t your only option for a convertible bed – there are sleeper sectionals, sleeper loveseats and sleeper chairs available to choose from. Sofas and sectionals tend to offer full, queen or king mattress options, sleeper loveseats tend to offer full sized mattresses, and sleeper chairs tend to offer a tucked away twin sized mattresses. There are a few optional different sized mattresses such as queen XL, check carefully to be sure that the mattress you get will fit standard bedlinens. In the event that you have an old sleeper sofa that you aren’t ready to replace, there are a few ways to improve the comfort. Purchase a memory foam topper to put on top of the mattress for increased comfort. Or look to replace the convertible mattress, be careful to check sizing both flat and folded to be sure it will fit your sofa and frame.